Strictly limited, hand-numbered 10 x 12” box set + 2 mix tapes + Compost logo metal pin + jute bag + sticker pack + liner notes. 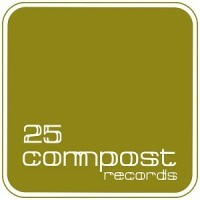 25 years Compost Records. Wow! For many people, the record label is rated among the best German independent labels for club music, and it specifically belongs to the leading labels for house, future jazz and downbeat. This box-set serves as proof of that achievement: Dozens of producers, DJs, label owners and companions sent them their thoughts, dedications and quotes. In fact, Compost is known worldwide for being the pioneer of the future jazz genre. The very successful and highly acclaimed compilation-series like "Future Sounds Of Jazz", "Glücklich", "Elaste" or "Party Keller" are still timeless highlights. For the 20 years anniversary they published a book - five years later, they put the music into focus even more again: The idea was to ask esteemed artists to reinterpret their favorite Compost tunes. So they are excited about getting both talented young artists and many of their all-time favorite producers involved in this project. Alongside the remixes and sold out vinyl label-classics, there are a few exclusive tracks in this strongly limited, hand numbered 10x12'' box. In addition, you can explore the impressive label history and background stories in the liner notes written by Michael Reinboth himself. On top of this, the anniversary box includes some Compost-gimmicks, a download code (for all vinyl tracks and some bonus ones) and a mixtape by each Michael Reinboth and Thomas Herb.